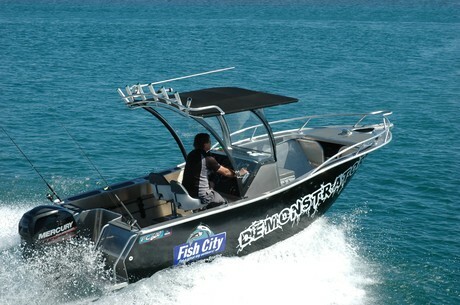 Fish City has released their newest model to its growing FC Boats range – the revolutionary FC600 Centre Console. Packed with features, the FC600 Centre Console is a culmination of ideas from the fishing fraternity and with a bit of kiwi engineering brings together what Fish City says is a revolutionary trailerboat for the New Zealand market. Fish City managing director Ross Christensen says that in designing the new FC600 they had to set about getting a combination of all the good characteristics of some great boats and pulling them together. “Everyone wants a nice light weight boat to tow, but then you get out to sea and it bounces around which then lends itself to not being very stable. Then of course, the deeper the vee you put into the design of a boat, the less stable it gets,” says Christensen. One of the key features of the new FC600 is the inclusion of a separate ballast and flooding keel system. There are two systems built into the FC600, aft there is a flooding keel, which floods when the boat is at rest, making the craft ultra stable, then when underway the water drains out quickly. In the forward section there is a controllable ballast system, enabling the skipper to bring onboard the desired amount of forward ballast, and then to dump it when not needed. A large leaver is located between the twin pedestal seats at the helm to control the amount of water. Open the valve, and at around 20mph the pick-up will fill the front 200L tank in around a minute. To empty the tank, move the lever to ‘Empty’ get the boat in motion and it will drain the water quite quickly. Centre consoles are great for fishing but traditionally don’t have good shelter. The FC600 features a large double console providing protection for four people and yet still has plenty of room for fishing via the full walk around. Like other FC Boat models, by removing the lower bung, the aft sump area can be converted into a live bait tank. The natural movement of the boat on the water will keep it oxygenated, and when underway will quickly drain the water out. The FC600 has a pick up through the hull so at any speed the baits get a good supply of water, there is a tap to close or regulate flow if required. Maximising the aft cockpit for fishing, all onboard systems such as batteries are housed under the helm console, allowing anglers to get right into the corners of the boat when playing fish. The aft corners also feature a great fold up seating arrangement, that when not in use for passengers, the seat lifts up and fold flush into the corner sections. In the bow area, the floor has been raised to provide more surface area for anglers and provides more underfloor storage big enough for dive bottles. A large chilly bin with squab is positioned in front of the helm console and provides another place for passengers to sit. Since 1992 Fish City, in Frankton, Hamilton and Albany, Auckland have been recognised as one of the country’s most comprehensive fishing, boating, marine and outdoor service centres in the country. More recently Fish City has moved into hunting and shooting bringing the same passion and level of experience and expertise to our land based hunters.